I had one of those moments this morning where I realised we'd turned one of the many corners in our parenting journey, a kind of "Ah there it is" moment. 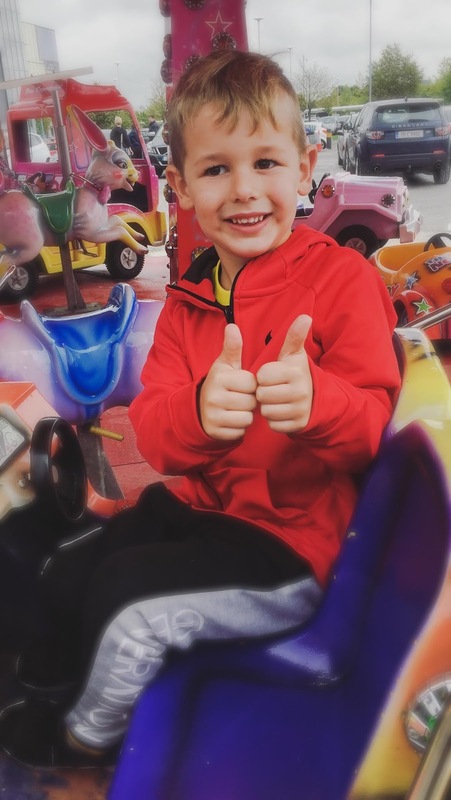 Up until recently we had been struggling a bit with Luke and his attitude and cheekiness, I put it down to the preschool to primary school transition and the adjustments that come with that. I know he found it hard to adjust in the first couple of weeks especially with the restrictions primary school puts on everything else. He had come from a fantastic, small preschool where they had so much freedom to play, learn and grow to the seriousness of primary school with double, if not more, the amount of kids in the class room so we gave him a bit of leeway to get used to it. I'll be the first to admit, he's a bit spoiled! He's an only child and the centre of our world, used to having our undivided attention and generally getting what he wants. He would always get something in the shop when we went in, it was normal for him to expect it because we always gave it. Now we try to teach him about earning it and not having money at his disposal to buy something when he wants it. He's not a brat and I'm very proud of his mannerly and kind nature but he wasn't used to hearing No all that often so when we started it was another shock to his system. Things at home were a bit up the air last month too and I've no doubt that affected him but we couldn't let him use that as an excuse. So myself and the OH had the chats and decided we needed to be firm but fair and be on the same page, reduce the shouting when we get frustrated with him because that does not work with Luke. He responds better to us ignoring him until he can behave. So when he's cheeky we would say "We can't talk to you when you're being like this. When you can apologise and speak nicely we will start again". He would sulk for a while but after a bit he would apologise and we would start over. When he wouldn't do something he was asked, we would withhold something he wanted to do / watch etc until he did as he was asked. We wanted him to realise that if he wants to do things he likes he must earn them and that includes doing as he's told. I think the turning point where he realised we meant business was last week when he'd been super rude and cheeky, not just to us but his Nan too which a big No as far as I'm concerned. His Nan looks after him while we are at work and I always try to explain to him just how good and helpful that is to us and he must respect that. So he kept it up all the way home in the car and I just put my foot down and said no books and no bath before bed that night , two things he loves - it would be a top to toe wash and straight in to bed. I didn't shout but I was firm and I stuck to my word. This happened 2 nights in a row and where he'd usually wear me down, this time he didn't and I think he realised we meant business. We firmly believe in giving him responsibilities, suitable for his age of course, so each morning and evening he must put his dirty clothes in the wash bin instead of on the floor, he must undress himself before bed and in the mornings he must open his curtains and blinds in his room. He'd been doing it the last few mornings but this morning it all just happened so seamlessly - he dressed himself into his school uniform without any hassle (we make it into a bit of game), he opened his blinds and curtains and went downstairs and put on his shoes, then, when asked, he proceeded to go and get his tooth brush and tooth paste himself and brush his teeth. It all just happened in a second nature kind of way, there was no asking numerous times, no one was getting annoyed - he's a bit of a messer and the master of delay tactics - but this morning it all just came together and it was wonderful! I'm not saying it'll be this way all the time because he's still a feisty 5 year old who loves to test boundaries but if we stand firm in our instruction and expectation of him I feel like we will continue this way and just to point out that our expectation of him is not to be perfect but to be respectful and understanding. My Mum even mentioned it yesterday that he was a lot more calm and a lot less cheeky this week. In our experience it's about presenting a united front on this, he knows I'm the soft touch and would try and play us off against each other but when he realised we stood firm and aid the same thing, it changed things for him. Kids love rules and boundaries, as much as they try to push them and break them, these boundaries give them security and builds confidence and there's nothing like the pride they have in themselves when they have done as they've been asked and earned their treat. Luke loves the praise we give him and stands proud when he gets the reward, be it a treat, some screen time or a simple high five from us.